Before 1923, the few local Catholics attended Mass at either Tavistock, the oratory at Buckland Abbey, or at St Anthony’s Convent established in Crapstone in 1917. 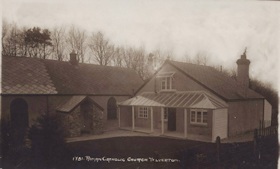 When the Poor Clares left Yelverton in 1922 to take up residence at Sclerder Abbey in Cornwall, Catholics in the area were once again left without a church or chapel. With the generous help of Lord and Lady Seaton of Buckland Abbey, it was decided to build a small chapel and presbytery in Yelverton for the growing number Catholic residents. A site on Princetown Road was chosen over one on Tavistock Road. The first structure was small and simple with an entrance where the side door is today. 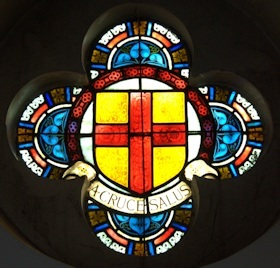 The dedication of Holy Cross was probably marked by a stained glass window donated by Lord and Lady Seaton with the family motto of “A Cruce Salus” (Salvation through the Cross). This window, now in the rear wall of the church, was probably originally situated in the south wall above the altar. 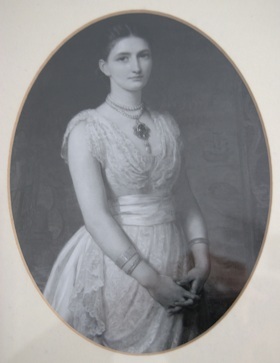 The Seatons and other beneficiaries in the parish gave many other artefacts for use in the chapel. In 1928 works were undertaken to enlarge the chapel and create a church. A new aisle was added on the south side and a tower with battlements and a graceful spire was built over a new porch and door. The north wall was demolished and rebuilt. The roof was stripped and recovered with slates. The whole edifice was ultimately rebuilt with solid stone taken from the quarries on Roborough Down and Buckfast Abbey. A new presbytery was built during the time of Father (later Canon) Costello after 1956 and the former presbytery now forms part of the parish rooms. In 1976 Fr (later Monsignor) Hanley was appointed as parish priest and under his auspices a second extension was completed and general alterations and repairs carried out. The works included an extension behind the altar, a new sacristy, the reopening of the south door and a new confessional. A special Mass was celebrated on December 16th 1978. Our benefactors, Lord and Lady Seaton died in 1933 and 1937 respectively and are buried in the cemetery of Buckland Parish Church. Our thanks to Margaret Davies for providing this summary from her booklet A Cruce Salus.